Holy wow it’s already the last Wednesday in March! Each year I think I’ve reached the end of enjoyable movies to watch for Made-for-TV March, but thankfully I’m proven wrong each time. 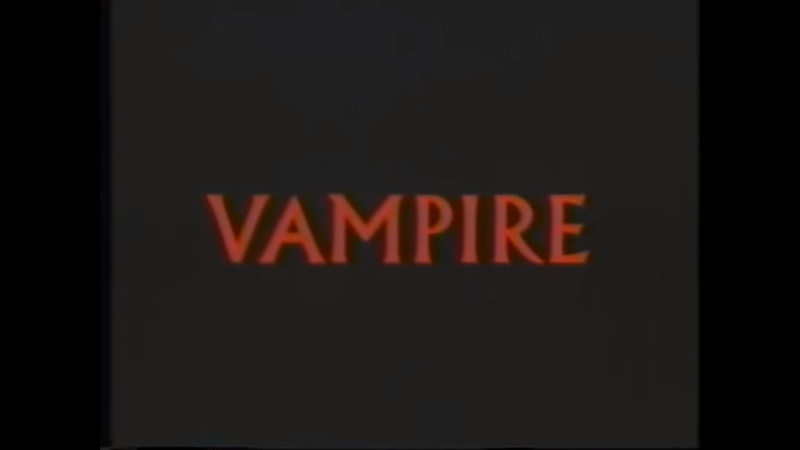 Vampire is one of the more classy made-for-TV films I’ve watched. It certainly has one heck of a cast with E.G. Marshall, Richard Lynch, Jason Miller, Jessica Walter and Kathryn Harrold rounding out the main roles. Young couple Leslie (Harrold) and John (Miller) are a fashionable couple. They love art, parties and history. But one night, after the dedication of a new church, something – or rather someone – awakens from the earth. During a party at their house, Leslie and John meet the mysterious Anton (Lynch) who is their friend Nicole’s (Water) new beau. She shows him off at the party, but Anton only seems to have eyes for Leslie and the art work in her home. After their meeting, Anton tries his best to get the couple working for him. Nicole tries to lure them in on Anton’s behalf. She tells them his family history, that his family had bought an old home that was later demolished when they couldn’t go to America after the war. Under the demolished home is a series of tunnels supposedly filled with priceless artwork. Leslie and John agree to help with Anton’s dig, especially after they see how much money they will earn. They begin the work and being to unearth the paintings. But John soon realises that the works are too priceless. He contacts the police after he and Leslie discover that most of the art work has been stolen in the past. Anton is arrested, but quickly released. He goes to see Leslie and begins to seduce her…kind of. When John finds her body, it’s more mutilated than anything. After Leslie’s death, John becomes a mess. He stalks Anton and begins to suspect the wealthy man of being a vampire. He’s eventually put into a mental hospital where Anton arrives to kill him. But the vampire is stopped by Harry Kilcoyne (Marshall), a former cop with a bone to pick with Anton. Anton flees to safety, and Harry begins to work with John to avenge Leslie’s death. The two men begin to track down all of Anton’s coffins and destroy each one-by-one. They face their biggest fears all in order to kill a vampire. Vampire certainly won’t be to everyone’s tastes. It is slow, almost meandering at points. And for a vampire movie, it’s pretty light on the vampire. But it is very stylish and there’s some fantastic acting here. I’ve seen a lot of people proclaim this as their favourite made-for-TV movie. Personally, I felt more drawn in by the first act and became bored by the time we had out vampire-hunting duo out. That being said, I could listen to Jason Miller’s monologues all day. What a voice! And he really has the ability to add dread and supernatural feeling to every scene. It’s a little, sleepy number. And great if you love Richard Lynch.